Which are the top toddlers toys for 2019? It's hard to find the perfect toy. Let us help you think about what you need to consider when choosing the right toys and buying them. Are you looking for the top toddlers toys for 2019? Then you have come to the right place. Whether you are looking for toys for your own children or for someone else's children then you are going to find something here to delight you! Toys play such a very important role in the life of a child. They help them learn how to share, promote the life skills necessary for their overall development, and encourage fun and imagination as well. Gifting toys to a child is as fun for the giver as for the kid who receives them. However, buying kids toys can sometimes be a challenging task, but with some careful consideration you can buy one that your kids will treasure. What Do You Need To Think About Before You Buy Any Toy? Before we look at what I think are some of the top kids toys this year let's think about what you need to consider when you are buying kids toys. A good toy for one kid isn't necessarily be a good one for another child. So, when you buy a toy, you need to consider the child's age, personalities, likes and dislikes. The first thing you need to consider when buying kids toys is the child's age. If the toy is beyond the child's level of development, then chances are there that the child might get frustrated and overwhelmed quickly. If the toy is below the child's developmental level, then they will lose interest and get bored. Buying the right toy can help the child's creativity and imagination to grow and blossom. Consider the learning or educational nature of the toy. Most toys have some element of educational value that it educates the child something useful, in addition to entertaining. But, this is not the case with all toys, where it is just a toy with no educational value. So, what you need to determine is what kind of toy you need to give your child. If learning aspect is important, then there are endless of options to choose from. Use your child's interests as your guide and let your own inner child have fun shopping. If your child is fond of animals, then buy them stuffed toy of their favorite animal. Choosing toys that your kids like will definitely bring utmost happiness in their hearts and smile on their lips. One of the most important considerations when buying toys for kids of any age is the safety issue. Every year, thousands of children get injured while playing with toys their parents, friends or family have bought for them. So, when buying kids toys, it should be inspected properly for safety. Safety concerns that should be considered while buying toys for kids include burns, shocks, choking, sharp edges, and pointed objects. If you are looking for some great toys for your toddler or, perhaps like me, to give as a gift then you may be slightly overwhelmed by the choice. 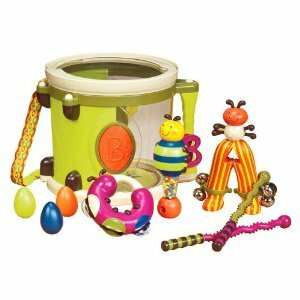 Some of the most popular toddler toys aren’t sold in stores so if you’re searching for something that’s unique and you know your baby would love then check below for some of the neatest selections and greatest deals. I am sure that you’ll be able to find fun and educational toys your toddler won’t hesitate to play with. Not only does this toy provide your toddler with a visual feast of colors, but it also allows them to stimulate their other senses such as sound and touch. 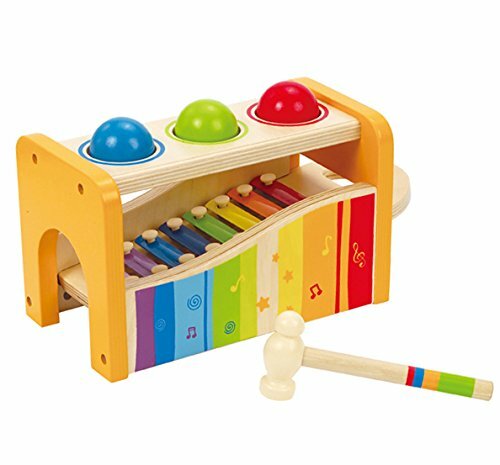 This Hape Pound & Tap Bench features a pull out xylophone that’s built into a colorful wooden box. You can also leave the xylophone in and pound on the balls until they drop on the keys for an exciting and surprising melody. The set includes a xylophone, a wooden case box, three balls and a wooden hammer. Everything is made from non toxic and child safe materials. You can literally fill an entire day with everything that’s in this wooden activity box. The B. 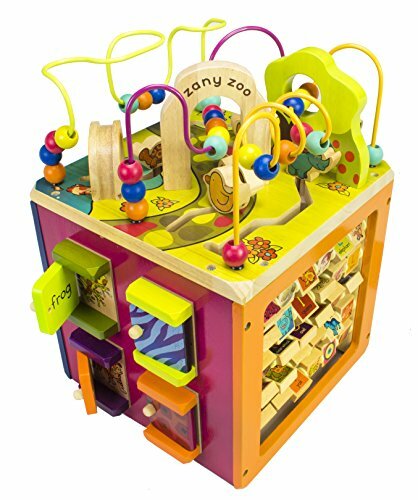 Zany Zoo features all sorts of fun activities that teach your children about letters, shapes, colors, animals, and so much more. 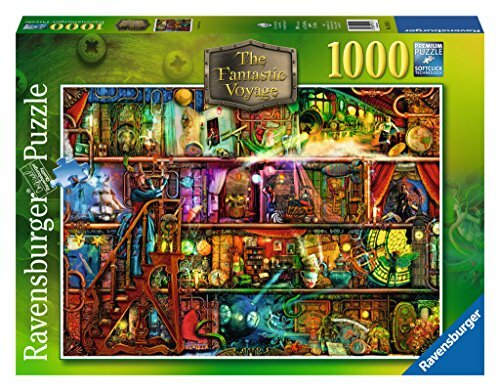 It includes activities such as zigzag paths, spinners, loopty-loo routes, doors to open and close, colorful wooden blocks with images of animals and the letters A to Z. The toy comes in a beautiful die-cut display box with an attached gift tag so it’s ready to be given to that special toddler. Make some noise with the Parum Pum Pum Drum. There’s nothing like the sound of bugs jamming to the beat of your toddler’s drum. This 8 piece musical set features silly centipede drumsticks, a jingle bell ant, a busy bee maraca and clacker, a caterpillar tambourine, and two shaka shaka eggs. Everything fit neatly in a transparent bucket that doubles as a drum when the lid is put on. The drum includes a big handle and a carry strap that makes it easy for your child to hold and wear while keep the beat for the rest of the band. This push wagon has been a long time favorite of toddlers for many decades. The Radio Flyer Classic Walker Wagon is the perfect size for your little one. The body of the wagon is made from all natural solid wood with removable sides, molded tires with grip tread, front bumper that makes it furniture friendly and extra safe, and sturdy chrome handle bar that your toddler can use to help them walk or push the wagon around the house. While some children love to get their hands dirty, others like to get their hands wet and the WaterWheel Activity Play Table from Step2 is perfect for such occasions. This activity play table features a wide receptacle funnel which pours water over a spinning wheel and into outer harbors and molded in sections that can create moats, lakes, ponds and the like. 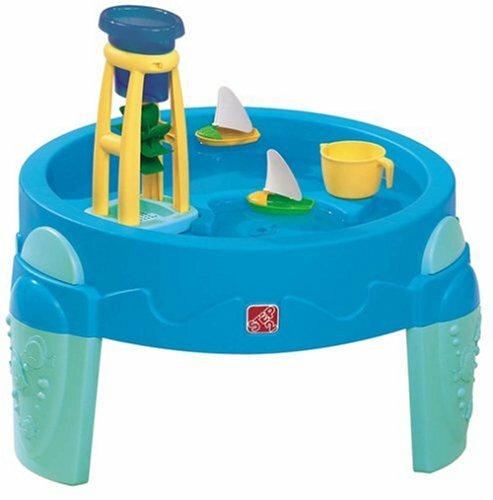 Included with the table are two toy sailboats, a cup and the water wheel tower. Your kids will really enjoy this wet and watery toy and the best part is there are no dirty or muddy hands to clean up after. Which Of The Top Toddler Toys Is Your Favorite? I can personally vouch for the Step2 WaterWheel. We have one and my grandson loves it. He's 3 and still plays with it all the time. And those noisemaker toys like the pound & tap bench and parum pum pum drum are always favorites with little ones.